You've gotta check out this glacier if you're in Southern Patagonia - it's probably the most impressive glacier I've seen in person. Being only about 80km from the town of El Calafate, this is a great day trip. It's also a good trip to do on a rainy day (so pretty much any day in Patagonia) due to the fact that that you can get so close to the glacier, so the clouds aren't an issue with viewing the glacier. Pictures don't do this justice - it's such a massive ice expanse, at over 3 miles in width, and covering 97 square miles. And what we can see is only a minuscule fraction, a gateway really, of the actual "Southern Patagonian Ice Field." Perito Moreno Glacier is one of 48 glaciers that are fed by the Southern Patagonian Ice Field. This ice field is the largest temperate ice sheet in the southern hemisphere and the second largest ice expanse in the southern hemisphere, second only to Antarctica. Click here to check out NASA's website for a panoramic of the Southern Patagonian Icefield taken from the International Space Station. Pretty good stuff. Pieces of the glacier floating around Lago Argentino. Their blue hue is striking. If you're lucky, you'll see a phenomenon called "calving," which is essentially "frontal loss" of the glacier, when ice pieces break off the glacier and fall into the lake. It's really loud, and can be dangerous - between 1968 and 1988, 32 people were killed from being hit by large pieces of ice. The drive from El Calafate to El Chaltén is absolutely breathtaking. The Seward Highway in Alaska is the only other highway that I've driven that offers such gorgeous views. Even if you're not much of a photographer, the route north to Chaltén up RN40 and RP23 is totally worth it. Nearly 360 degree panoramic mountain views from the drive to El Calafate to El Chaltén. But only if it's clear! As soon as you get a good view of those peaks, you'll most likely have an overwhelming urge to hike and get as close to them as you can. Click here to read more about that. But once you've gotten that out of your system and you're nice and tired and sore, you've got to check out the town - so many authentic places to eat post-hiking! My favorites were Cerveceria Artisanal (free popcorn and breadsticks), Don Guerra (all wood exterior and interior, a ski-chalet feel), and La Nana. La Nana had great coffees for pre-hiking energy, and they also sold easily packable pastries / baked goods for hiking snacks. My horse, Sam. A gentle giant. Horses are a way of life in this region of the world. I've been horseback riding in some pretty spectacular places on this earth, and this one probably tops the list. There's an array of horseback riding tours in Southern Patagonia. And some are pretty pricey. So I suggest doing something I don't normally do - going to a local tourist travel agency and discussing with them the type of riding you want to do and prices. I went to an agency called Baft in Calafate. The guys there were great (and spoke awesome English, which was helpful). I booked a two-hour horseback riding tour at Rio Mitre with a real working gaucho on a real working ranch. Dinner was included - steak cooked fresh. The ranch, Rio Mitre, was nestled in the mountains, in such a serene setting. About an hour's drive from Calafate. A driver picked me up at my hotel and drove me to the ranch - I later learned it was his family's ranch (his father and mother were the ones serving me coffee and preparing dinner). As the gaucho tacked the horses, I got an entire cafe / bar to myself and was served piping hot coffee. I was shown some family heirlooms and artifacts found on the ranch while I was waiting - I got to hold a petrified monkey head, a dinosaur egg, dinosaur bones, and lots of tools/weaponry made by the indigenous people of the area. This was a real working ranch - the guy that booked the trip made sure I understood this, and I did have to pull out lots of high school Spanish vocab that I had stuffed away. But I wouldn't have it any other way - it was an authentic glimpse into what life on a working ranch was like in the mountains of Argentina. The ride went by so quickly - spectacular mountain views. The horses at the ranch pretty much had free range to roam, rather than being kept in small pastures - it was so cool just coming across a group of horses and the gaucho knowing them all by name. Bundle up - it gets chilly. The gaucho and his next project, a palomino foal. After the ride, dinner was served. It was absolutely amazing. Both the food + the views of the horses grazing on a backdrop of misty mountains. These caves are right outside of El Calafate - so this is more of a half-day / morning trip. But it's pretty cool stuff, and the scenery is amazing. The drive to the caves gives awesome views of Lago Argentino - turquoise waters and deep blue mountains, mirrored by vast orange fields opposite the lake. These caves are known for their paintings made by aborigines during the Paleolithic age. It costs $12 USD to enter - this includes an audio guide for your self-guided tour around the caves. Not all of the paintings are original - some have been "restored" using the same techniques and paints that would have been used during that time (bummer, I know). This is worth mentioning in this post of "must -sees" - it's a destination within itself, and it's been my favorite AirBnB stay to date. 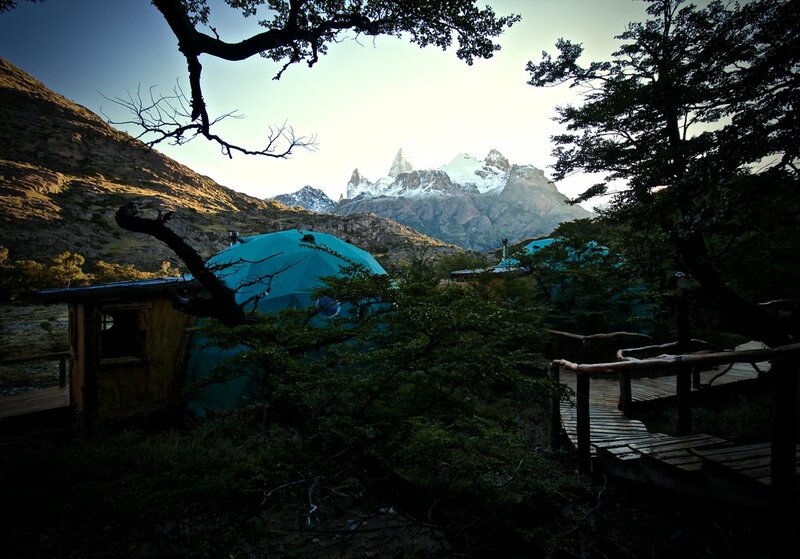 These unique self-sustainable EcoDomes are situated right next to Los Glaciares National Park, about half-hour north of El Chaltén. It's a hefty price, but if you book on a bargain website like Kayak.com, you can get a slightly cheaper price. Trust me, waking up to those views is worth the price. Bar + Dining Area. View of mountains is incredible (but the camera wasn't picking them up). Boxed lunches were offered for any long days of hiking / backpacking. Then you'll be taken to your individual EcoDome. And you'll get pretty excited when you see it, and might start contemplating building one when you get home. These EcoDomes are comprised of an entryway area, bedroom (twin, single, double, or King beds), and bathroom (shower, toilet, sink, hot water). As long as you tend to the woodstove, the place stays pretty warm, though I'm not sure I would be warm enough had I gone in the middle of the coldest months. You just can't put a price on this view. I could have laid in bed all day, mesmerized by the jagged peaks of the Fitz Roy range. All the domes have an equally nice bedroom view of the mountains.